I was recently contacted by the lovely people at StyleChi.com giving me an opportunity to become one of their ambassadors. In return, they asked me to have a little play on their site and let them know what I thought, and were nice enough to credit my account with 10,000 points (in UK terms, I'm told that's about £5). So what is Style Chi? Style Chi is a newly launched, unique and interactive shopping site based around your favorite social networking sites such a Twitter and Facebook. The site is unlike any other, you can actually reduce the prices of items by up to 50% on the site by simply sharing it, liking it and adding or inviting friends. It is really that simple! As a boarderline Twitter addict and fashion lover this sounds almost too good to be true! How could I refuse! Since 200, the site has won won over 60 industry awards and is a current finalist in The Drums, CIPR Awards and SABER Awards 2013! They've got some great brands on board such as River Island, Steve Madden, Converse and Rare London! Where do I sign up? After hearing all that I just had to have a go! I completed the super easy sign up process I was sent straight into a quick tutorial, showing me how to get around the site with tips to earn extra points, such as uploading a profile picture. I did find this a little tricky as it was taken from the screenshot of my Totally Twisted Braid Tutorial so wasn't already square. And, being the complete perfectionist that I am, it just had to be in the middle! I love, love, love the colour of this bag, it's just perfect! 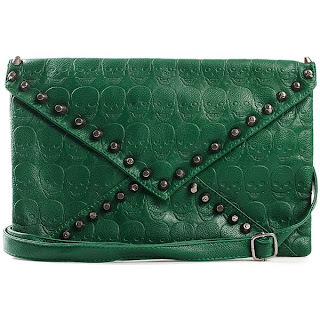 And the skull and stud detailing is still bag on trend! Some of you may have seen my tweet about this earlier in the week, that was because I was testing out Style Chi's share function, and I earnt myself some pretty points whilst I was at it! 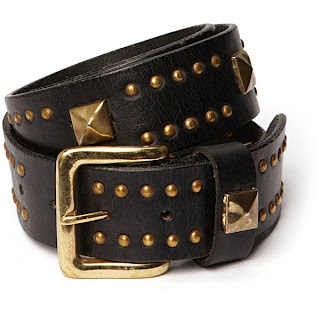 Being the budget conscious blogger that I am, I did a quick Google of this accessory to check the pricing and found it at Nelly.com (in black on Style Chi) for an astonishing £27.95! So, not only are you saving money with Style Chi, you're also saving a further £8 off the price! What's not to love? Adding the bag to my cart earned me +100 points, as did liking the bag on Facebook. I still haven't managed to convince myself to complete the transaction, if you would like to be an enabler (please do!) comment below! I also really like this chunky, studded belt by Friis, the name pun is quite clever too. But I also found it for £19 (sold out) at Polyvore. As for the overall style of the site, the selection is chique but small and it has some great unique pieces too, like these snake earrings by Mi Lajki, I can't work out whether they're cute or scary! There's also a style site for him too! Let me know if you sign up in the comments so that we can be friends! Images courtesy of Style Chi.